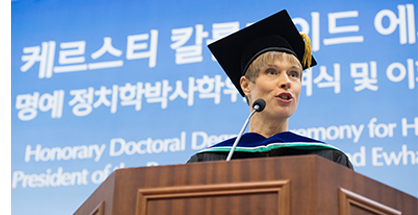 Ewha granted an honorary doctorate degree in politics to Kersti Kaljulaid, President of Estonia, at LG Convention Hall in the International Education Building on Wednesday, October 10, 2018, 2 p.m.
After the conferment ceremony, Ms Kaljulaid talked with students about “the digital innovation, entrepreneurship and the future society” in a session of “Conversation with Ewha Global Leader”. In the session with the Distinguished Professor Go Geon, she elaborated on Estonia’s issues such as the digital innovation and major services of the Estonian government, reasons and effects of deregulation of block chains, keys of astonishing economic growth after the independence from the Soviet Union. 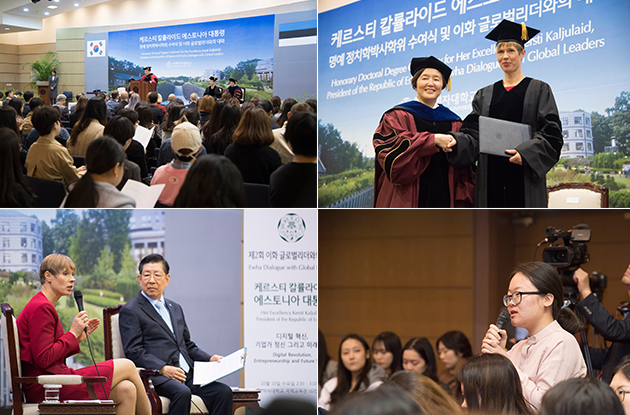 In addition, in responses of students’ questions relating to the cyber security, the technology industry, and prerequisite for a digital leading country, she referred to the digital ID system of Estonia and stressed the need of systems and education that are suitable for a new cyber environment. Kersti Kaljulaid, President of Estonia, was selected as the first and youngest female head of state of Estonia in its history at the age of 46 in 2016. She majored biotechnology and graduated with a Master’s degree in business administration. From 2004 to 2016, she was the representative of Estonia in the European Court of Auditors for 12 years, and served as a chairperson of the board of directors at University of Tartu.